This is the unique episode where Lt. Tragg is surprised to see Mason and Burger working on the same side. While on vacation, Hamilton Burger introduces his fellow duck-hunters to Jeff Pike, an old friend who saved his life in a boating accident twelve years before. Now Jeff is in trouble and wants Hamilton's advice. Jeff and his son are at odds with a man who is later murdered. Since the L.A. District Attorney's office has jurisdiction, Hamilton disqualifies himself and asks Perry to defend his friend. Location: �I believe the opening scene here is at the corner of Kanan Rd. and Agoura Rd. in the parking lot of a place called Whizins.� Submitted by Mitch English, 10/2/2005. + Google map here. This is in Agoura Hills, CA. There was a Whizins restaurant at �Cornell Corners� near the time of the series. Today, the Whizins Shopping Center is located northeast of the intersection of Cornell Road and Agoura Road. This is about a mile east of Kanan Road. Submitted by daveb, 18 December 2007. Location: I, too, thought the opening scene was Whizzins until I bought the DVD and on the cleaner, clearer copy saw the �Saddle Peak Lodge� sign. I�ve eaten at the Saddle Peak several times. It has gone from the roadside BBQ you see in this episode to five-star fine dining. It has a history with Hollywood types all the way back to Clark Gable. It�s only a few miles from Malibou Lake which is a favorite location for Perry Mason episodes. For more information on the history of Saddle Peak Lodge go to their site here. Submitted by Eric Cooper, 2 September 2010. Some pictures here. This is the only episode where Paul Drake does not appear. William Hopper appeared in 270 of the 271 episodes, more than any other person, even Perry himself. Submitted by PaulDrake33, 6/24/2008. + IMDB is totally incorrect. They are just automatically listing the three main stars as being in all of the 271 episodes. But, as we all know, all three of them have missed appearing in various episodes. I don't know why they did this when they list an accurate number of episodes for both Burger and Tragg. Someone was obviously very lazy :p Submitted by Arisia, 02/16/2018. + My records, and a quick check, show that Paul Drake did not appear in #80, �The Case of the Violent Village,� either. Submitted by daveb, 6/24/2008. + Jim on the Perry_Mason Yahoo! group notes that Paul also was missing from #219, �The Case of a Place Called Midnight,� as well. Submitted by daveb, 9/8/2010. ++ Perhaps IMDb is counting credited episodes. Hamilton Burger sits in the spectator gallery in this episode. He is also shown wearing casual clothing. Submitted by PaulDrake 33, 30 October 2009. +In the courtroom scene in my copy, Burger wears a tie and a coat, not casual clothing, although he does indeed sit behind the bar. Submitted by DocRushing on 01 August 2012. +I think PaulDrake 33 meant that Burger was shown wearing casual clothing in this episode not necessarily in the courtroom. Submitted by Wiseguy70005, 11/10/13. We get a shot of Denver Leonard�s car registration in the opening scene. For a change, the address is not that of a studio. More here. Submitted by daveb, 9/8/2010. In Ep#9, the Lic No shown on Addison's registration form was the number actually seen to be on the licence plates of a different car in the episode (see Prop Anomaly under CARS Trivia). In this Ep#83, the Lic No on Denver Leonard's registration form (NFL 252) doesn't match the number we see on his front licence plate (SDL 689) when he backs his bull-horned Buick out of his parking spot! It's not the number on Burger's plate either [see CAR(5) below]! Submitted by Gary Woloski, 20 June 2012. + Denver Leonard�s same 59 Buick Convertible, but without bull horns, appears again in an LA restaurant parking lot in Ep#86 TCOT Mythical Monkeys: Perry reads the Registration Form and finds the same Lic No NFL 252 registered to "Richard Gilman", resident at "350 Sierra Rd. ", the same address as Denver Leonard in this episode #83! Also, in ep#86 the car is still a "Convertable" (see here again), but its engine has been switched for Engine No Xy547769! It also cost $48.50 for Gilman to register his Buick. See Comment below. Submitted by Gary Woloski, 27 June 2012. Where does GW get $48.50? I see only $48. Submitted by 10yearoldfan, 27 August 2012. + It cost Leonard $48 to register his '59 Buick "Convertable" on 8 Mar 59. But Gilman's Registration Form in Ep#86 indicates that on 23 May 59 it cost Gilman $48.50 to register his identical car. My object was to point out the anomalies on the Automobile Registrations in the series: every one of them I've read has at least one goofy entry on it. GW 28 Aug 2012. + According to an online inflation calculator $48 in 1959 is the same as $410 today. Pretty expensive registration fee, I'd say. Dad-blame-it! Submitted by Kilo 5/14/2018. ++ 10 years ago, my sister paid $500 to register her car in California. Sightings: Courtroom regulars Little Old Lady in a Hat and Quiet Old Man #1 sit on the prosecutor�s side, although they are most easily seen when court adjourns. When the hearing reconvenes, they are gone, but Distinguished Lady #2 fidgets quite a bit in the second row. Read about these and other recurring spectators here. Submitted by gracenote, 9/24/2010. + Almost missed one! Distinguished Gentleman #1 hides behind another spectator in the first part of the hearing, but if you look carefully you can see the tiniest bit of his face. (And in the second part, the Little Old Lady reappears, too, peeking between other spectators� heads, though you can scarcely see her.) Submitted by gracenote, 9/25/2010. + Room for one more! The aforementioned Gentleman serves at the concession stand behind Perry and Della as they talk with Ruta Lee. He brings them coffee to their table, too. Submitted by gracenote, 11/12/2011. + Also in the front row of the gallery (prosecutor�s side) is the Cute Young Lady. In the back row on Perry�s side, sitting right next to spectator Hamilton Burger, is Little Old Lady #2. Submitted by gracenote, 11/26/2011. + Room for one last addition as Miss Carmody watches from the front row behind the Prosecutor. Submitted by Bill767, 10/31/15. Character Names: Michael Fox�s character, listed as Autopsy Surgeon, is called Dr. Hoxie. Dennis Patrick�s character, listed merely as Prosecutor, is called Darryl Teshman. John Alonzo�s character�s first name is Pedro. Submitted by gracenote, 9/25/2010. + I, too, would have gone with the Darryl spelling but the closed-captioning on the CBS/Paramount DVD gives the spelling as Darrel. Not being familiar with this spelling I looked it up in a baby book of names and the name was listed under Darrel with all other spellings such as Daryl and Darryl listed as variants. Submitted by Wiseguy70005, 11/10/13. (1)white 1959 Buick LeSabre Convertible (or Invicta) w/bull horns, top up, Lic No SDL 689, Denver Leonard. (not the top end Electra since there's no Electra badge on front fender). (2) Alfa Romeo Giulietta Spider ("Spider"=Open 2-seater), intro mid-1955 - Fred Pike. (3) 1959 Ford Galaxie Skyliner ("Skyliner"=retractable hardtop), black, top down - Mason. (4) 1958 Ford Fairlane Fordor Sedan POLICE, black w/ Sheriff star on door, whitewalls, spotlights but no roof cherry, somewhat like this - Lt. Tragg & his Squad. (5) 1959 Buick LeSabre 2door Sedan, med color, Lic No SFH 106 - Hamilton Burger. 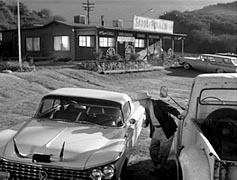 Burger drives the '59 LeSabre Sedan here but in Ep#85, TCOT Wary Wildcatter, it belongs to fraudster Charles Huston. Perhaps the D.A. imprudently traded his car for a dubious oil well investment & got taken for a ride! Submitted by Gary Woloski, 22 Jun 2012. So Burger has been a hunter for at least 12 years according to this episode. However, in episode 3, "The Nervous Accomplice," aired only two years before, Burger didn't recognize a shooting stand calling it "that...whatever it is." Submitted by Wiseguy70005, 1/20/15. RB played an Imprudent DA hounding Montgomery Clift's character in "A Place in the Sun" 6 years Before he became America's Quintessential Defense Attorney [IMDb]. Mike Bedard 3.8.15. Perry's Apartment, Perry In Pajamas: Once more we get a look at Perry at home, relaxing. jfh 13Aug2018. The priceless moment in the show is when Hamilton Burger mutters under his breath (but not so quietly that we can't hear it!) in response to Dennis Patrick's 'Prosecutor's' objections, "Shut up, you fool!" (From memory, not verbatim) And Dennis Patrick? I almost expected HIM to be found guilty! Submitted by MikeReese, 9 September 2012. My Apologies to the Crew for being so PICKY! (Trivia, lic plates & Registrations) The apparent connections and anomalies on Car Registrations, Licence Plates, cheques, newspapers, envelopes & other props in the series might be due to deliberate prankishness by the Production Crew but perhaps some anomalies just resulted from the pressure of the Production Schedule. They probably weren't concerned that pesky People from the Future would give their work such close scrutiny aided by slo-mo and stop-action Home Video Players. I realise that it's not fair to them for me to do that. However, the rich detail that they put into every episode is a major part of the attraction of the Series for me and I simply can't resist looking at it! Submitted by Gary Woloski, 27 June 2012. + There's no truth to the rumor that, through force of habit, Dennis Patrick's character was bumped off at the end of the episode. Submitted by BobH, 15 October 2016.